Just wanted to check in... did Cooker ever resolve or get back to you with info? I've been away from home for the past 5 weeks. I am sending a follow-up email to Coker tonight to see what they found. I will keep you posted. I am leaving for a the better part of a year soon and don't want this issue to rear it's ugly head when I get back! I am still waiting for a reply from Coker. I do have another question however. The shop I just got her back from noticed the wheels were toed-out when I dropped her off. I had them look at the front end for any problems that might have contributed to the wheels cracking, especially since I had just had the car aligned...something had to be off right? They found a lower control arm bushing was loose and "tacked" it place. Tonight, I went to my local car club meeting and the front wheels began squealing while driving again. The shop owner was there and we looked at my car on the way out. The wheels are now toed in... I wonder if the tack broke. Looking through my shop manual, I read that there are "shims"?? to stop the fore/aft movement of the lower control arms? I'm looking at 6-10, "Lower arm and coil spring installation". I searched and read through some years previous posts about control arm replacement and read Daves responses in several locations about the "stamping-in-stamping" and that they were made to be a very sloppy fit. The bushing are all new with less than 40 miles on them as the rebuild has continued through 5 years. 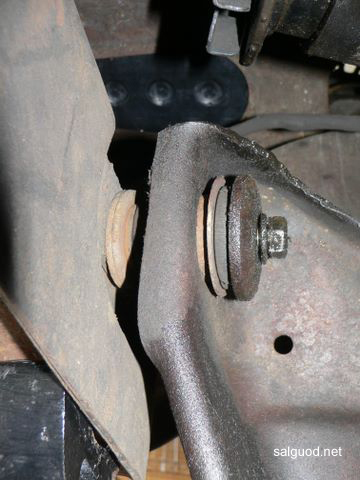 Could the shop I had the original suspension work done at 5 years ago not installed these shims and now I have fore/aft movement of the lower control arms that are changing the alignment while driving? If this is true, I can see how a constantly changing alignment could cause severe stresses on the wheels. Could this be as simple as installing shims on the lower control arms? I'm going to pull the front end apart this week and see if I can find any movement that the last 3 shops seem to have overlooked. Last edited by c4clewis; January 4th, 2017, 10:32 AM. Got the time to put the car up and check the lower control arm bushings that the shop welded tonight. I have had the car at 4 different shops. 4) Latest shop that found the movement in the lower control arms, but didn't try to tighten the bolts apparently and just tried to weld it. The welds had broken. So I checked the movement. I had almost an 1/8" at the lower bushings. I tightened everything down, including the ones that the shop had welded and no more movement. Just for S&G, I tried the upper arms bolts...guess what...yup, just beyond finger tight there too. So, either the shop that I had the arms powder coated at 5 years ago never tightened them down or they worked their way loose somehow. I shouldn't have to check shops work... that's why I hate taking my cars places and choose not to most of the time! Time for another alignment and hopefully this one is the last time I have to deal with this. Last edited by c4clewis; January 5th, 2017, 12:48 AM. ...Looking through my shop manual, I read that there are "shims"?? to stop the fore/aft movement of the lower control arms? I'm looking at 6-10, "Lower arm and coil spring installation". Could this be as simple as installing shims on the lower control arms?.. Matt, control arms need to be installed following a specific order. Let's back up a bit for some background. Sheet metal varies widely. We commonly see steel thickness change right in the middle of a coil. No two car bodies are identical, even though they were built in the same fixtures. We try to eliminate as many variables as possible but that's the nature of stampings. Ford knows this very well and they make provisions for adjustments all over the car just to keep dimensions 'in control'. Suspension is no different. 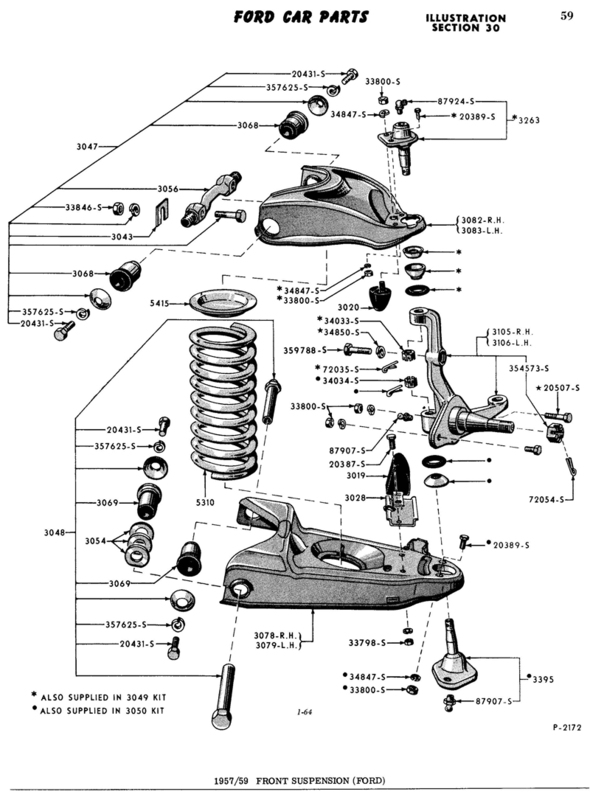 This illustration is of the LH suspension. 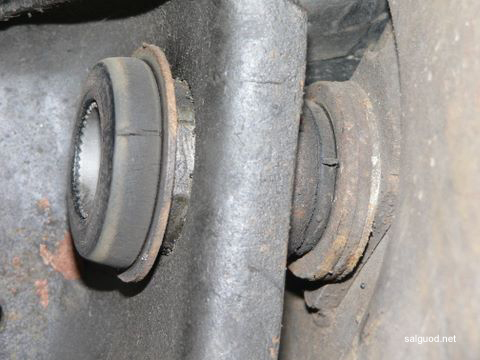 The idea is, when the lower control arm is installed (before the spring), it should be shoved rearward all the way and shims should take up any space between the #1 crossmember and front bushing. Then the bolt is inserted but left loose until later. After the spring and ball joints are assembled, the car needs to sit level, AND THEN the suspension bolts should be tightened. **Refer to 9-3 in your Shop Manual under, "LOWER ARM AND COIL SPRING INSTALLATION." Ford suspension rotates on urethane. If the bolts are tightened while the wheels are hanging, the control arms will hyper-extend the urethane and tear it up prematurely. So, control arm range of up/down travel should be equal from where the car sits level. Also make sure your upper and lower bumpers are installed. At our assembly plants, the worker walks in a pit where he tightens suspension bolts. If you don't have a pit, rest your front wheels on ramps and use jack stands on the rear sub-frame members. THEN tighten your bolts. Don't be surprised to find mechanics who improperly set suspension because they simply don't know, have no experience or they didn't read proper procedures. Problems don't show up until later, after the job is 'done' and paid for. For reference, here's a picture of my lower control arms before I removed them. Doug, if your control arms have shims on both sides it's because someone was trying to gain more or less caster (or 'rake' as we used to call it). Normally, this is achieved using different shims on the top bar, one side having more than the other, which pulls the wheel forward or backward. If the top requires too many shims on one side or they simply run out of adjustment, then the lower arm shims can be moved around. We normally see this if the car was in an accident where the subframe was bent. Otherwise, the Ford illustration holds true with shims on one side only. The shop I just got her back from noticed the wheels were toed-out when I dropped her off. now I have fore/aft movement of the lower control arms that are changing the alignment while driving? So what happens ? When you reverse and apply the brakes you get toe-out and when driving forward and applying the brakes you get toe-in ? No, I was showing the front of each control arm. There were no shims on the rear. These were before I took it apart, I put the same shims back in that I took out. Yes I got that, Doug. It follows my first post. However, I've also seen where the shims were divided in the same lower control arm (not yours) to move caster settings forward or rearward. Make sure you get those shims in AND the bolts TIGHTENED!!! I went through several wheels because a shop never tightened them. I couldn't figure out what what causing the wheels to break, yes literally break. Without the shims in and tightened, every time you hit a bump it can change the alignment. Matt, I found this post on another thread (about lower control arm shims). Are you saying this IS the cause of your broken wheels? Dave, as far as I can tell, I think this was the cause of the wheels cracking. I only had a few days to drive it once I got the bolts tightened down, and boy did it make a difference. I wish I had more time to drive it before I lef tot tell you for sure, but I've been in Afghanistan for the last 3 months now. So the definitive answer will have to wait until next year. But, yes. I think that was the cause. After getting settled in after yet another move and meeting Ray at the South Texas Thunderbird Club meeting last night, I can say with definity that it was the loose lower A-arm bolts that were causing the cracking. Why the bolts were either never tightened at the shop that put the front end back on after powder-coating I don't know. I have also had several alignments as the front end kept getting wonky, but those aren't bolts that would normally be checked I guess since there isn't any adjustment to them. If any of you have excessively wandering steering when you hit a bump in the road, may I suggest checking all the suspension bolts when you put your car up on a lift next time. After I found those loose bolts, I went through the entire front end and tightened everything, made a world of difference. There is a saying in my profession that I guess I need to bring to any work that I have done on my cars... Trust but verify. I hope you tightened the bolts while the car was on its wheels and sitting at a normal stance. I can guess, that was the reason why this tightening procedure was omitted and then forgotten. Tightening urethane bushings while the wheels are hanging will hyper-extend the urethane which causes early failure. This is why it is so important to follow the Shop Manual procedures. In your case, you didn't do the work but hired someone else. Sometimes shops have multiple workers do your job. This comes from working with electricity which cannot be seen but requires a high degree of safety to avoid injury and component damage. You ultimately corrected your job, yourself. For this reason alone, I do my own car work. Mechanics cannot take their time and make money but I can. Also, I'm the only guy working on my car so that ends assumptions.